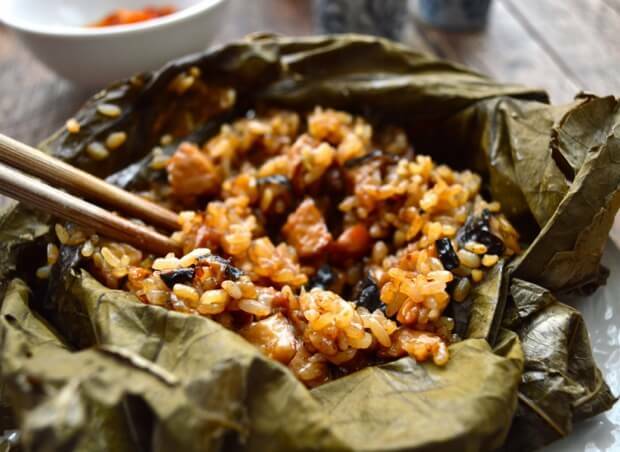 For Sunday dim sum, we always order Dim Sum Sticky Rice wrapped in Lotus leaves or Lo Mai Gai (Cantonese) aka Nuo Mi Ji (Mandarin), which are basically steamed sticky rice and chicken wrapped in fragrant lotus leaves. In a medium bowl, stir together the marinade ingredients and add the chicken pieces. Stir well and refrigerate. Soak the sticky rice for 2 hours, drain, and mix with 2 tablespoons dark soy sauce. Set aside. Over high heat, add 2 tablespoons oil to your wok. When the wok is smoking slightly, add half the mushrooms and stir-fry until they’re browned, tender, and most of the moisture has evaporated. Remove from the wok and set aside. Do the same with the second half of the mushrooms. (Cooking the mushrooms in 2 batches prevents them from getting soggy). Set all the mushrooms aside. Heat your wok over high heat again with a couple tablespoons oil. Brown the chicken. Mix in the mushrooms, scallions, and salt. Stir-fry for a couple minutes to let the flavors meld together. Mix this chicken mixture with the soaked rice. Now you’re ready to wrap them in the lotus leaves. Brush a small section on one end of each leaf lightly with oil. Put about ¾ cup of the mixture on the oiled area. Wrap each into a rectangle, tie with kitchen string, and steam for about 90 minutes. You can serve with a little chili oil or allow them to cool, place into freezer bags, and freeze for later! When you’re ready to eat them, just steam them right out of the freezer for about 30 minutes.